Emerald cut diamond solitaire rings, each set with the elegant simply faceted step cut Emerald cut diamond, in a range of designs. Please allow approx. 14 working days for delivery. The Meadow engagement ring design dazzles with the fire from an Emerald cut diamond, enhanced by precision set princess cut diamond shoulders. The Meadow engagement ring is styled with a step faceted, Emerald cut diamond shown here in the 1.25cts diamond sizes. In addition to your chosen diamond this delightful ring design contains an additional 0.21cts of Princess cut diamonds channel set into the shoulders of the band. Choose any diamond option for this traditional 4 claw emerald cut diamond solitaire engagement ring with classic styling. Traditional 4 claw emerald cut solitaire engagement ring. This ring features a classic design, with squared 4 claw setting to compliment the emerald cut diamond. Slim tapering shoulders and a comfortable court profile band make this a very popular setting for emerald cut diamonds. Please allow approx. 3 weeks. Most diamond options are provided with full certification. Emerald cut diamond ring with finely crafted diamond double diamond shoulders, created to your exact preferences. Finely crafted with double diamond shoulders, fine claws hold an additional 0.25cts to your chosen central stone. Choose your emerald cut diamond specifications to be set within four squared claws within this exceptional ring design. Please allow 5-6 weeks for completion in your chosen options. Accompanied by full GIA, IGI or HRD certification. Modern, simple and wonderfully styled 4 claw emerald cut diamond engagement ring with a unique sideways set emerald cut diamond. 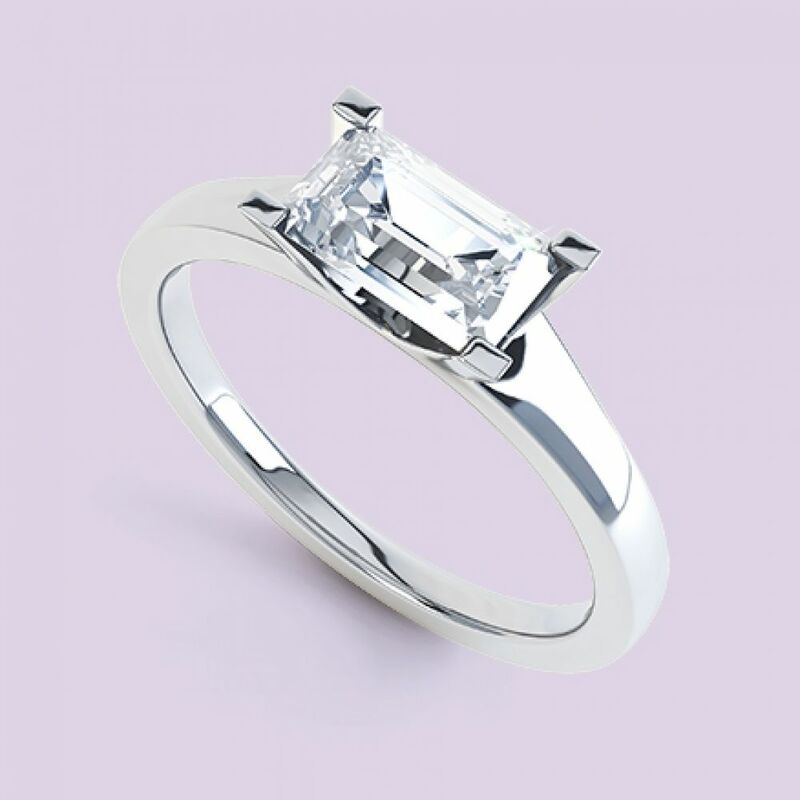 Modern, open and stylish 4 claw design, holding your own selection of emerald cut diamond. This exceptionally simple design echoes finesse with slim tapering shoulders and a beautiful court profile comfort fit band. Timescale is typically around 3-4 weeks with beautiful packaging and insured delivery as standard within the cost. 4 claw emerald cut diamond solitaire engagement ring with straight flat profile shoulders and squared claw setting. With squared claws, and a straight flat profile band, this simple ring design suits many optional sizes of diamond. Created to order with a perfect finish, most diamond options include full certification from GIA and IGI laboratories. Please allow 3-4 weeks for completion. Emerald cut diamond engagement ring with simple 4 squared claw setting above a wedding ring friendly ring design. Emerald cut diamond, Four claw setting, Wedding ring fit allows wedding band to fit alongside ring. Open tapering shoulders. Available in 18ct White Gold, 18ct Yellow Gold, 950 Palladium and 950 Platinum. Wood boxed. Gift packaged. 14 working days delivery. A four claw Emerald cut diamond solitaire engagement ring with four claw wedding ring friendly setting. Emerald cut diamond. Unique design allows perfect wedding ring fit. Elegant 4 claw setting allows in light. Tapering open shoulders. Available in 18ct White Gold, 18ct Yellow Gold, 950 Palladium and 950 Platinum. Wood boxed. Gift packaged. 14 working days delivery. Emerald cut 4 claw diamond solitaire engagement ring with slender tapering shoulders and elegant detailed setting. A four claw setting emerald with a wave detail to the side. Available in 18ct White Gold, 18ct Yellow Gold and Platinum, Wood boxed, gift packaged, approx. 2-3 weeks delivery. Emerald cut diamond solitaire engagement ring with 4 claw setting, squared claws and a D shaped rounded band profile. Ultramodern, contemporary solitaire design. 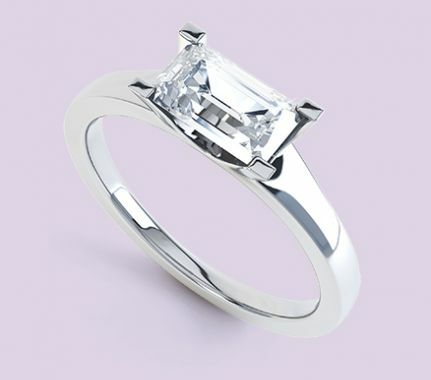 Beautifully considered D shaped ring profile, set with an emerald cut diamond, with 4 squared claws around each corner. We advise VS clarity for the diamond with most options including full GIA or IGI certification. Wood boxed within approx. 3-4 weeks for delivery. Simple 4 claw Lucida styled emerald cut diamond solitaire engagement ring with slim straight shoulders. Emerald cut diamond, Four claws, Crossover detail. Flat profile, Available in 18ct White Gold, 18ct Yellow Gold, 950 Palladium and 950 Platinum. Wood boxed, gift packaged. Approx. 14 working days delivery. Classic styling is provided within this 4 claw emerald cut diamond solitaire engagement ring with fine tapering shoulders. Classic 4 claw emerald cut diamond solitaire engagement ring. This ring design features traditional styling elements such as the tapering court profile band with slim narrowing shoulders rising to the beautifully subtle emerald cut diamond. We recommend a VS1 clarity minimum where possible for this diamond cut. Most options include full diamond certification from GIA or IGI laboratories. Please allow 3-4 weeks for delivery of this ring. Modern, simple East-West set Emerald cut diamond engagement ring with four claw setting. Modern four claw setting. Wedding ring friendly design. Choose your Emerald cut diamond from a range of available sizes, carat weights, colours and clarities. Tapering open shoulders, and court shaped ring profile. Please allow 3-4 weeks for your ring to be created to your exact specifications. Emerald cut diamond engagement rings present a more subtle alternative to the brilliant cut styles so popular for engagement. The square cut of diamond takes the form of a rectangular shape, with cut corners. A rectangular stone which is best set into a four claw setting, either running lengthways along the finger, or alternatively East-West as in style R1H034. The pricing of emerald cut diamonds tends to fall in line with many of the fancy shapes of diamond, and prices are usually less than the round brilliant cut, which is perhaps the more popular and standard for single diamond engagement rings.